Lock off apartments: Does zoning allow them? Biss gives a short speech about good city-building policies – Steven Can Plan on Don’t know who to vote for? Start your research using my friends voter guide! Update, Jan 21, 2015: Pace unveiled their plan for ART and their request to Congress to make the ART plan a project of regional significance to attract more funding. Pace, the suburban bus operator in Chicagoland, is constructed an Arterial Rapid Transit bus route on Milwaukee Avenue from the Jefferson Park Transit Center in Chicago – a busy intermodal station where Metra and CTA buses and trains stop – to Golf Mill Mall in Niles. Both of these are major transfer hubs. 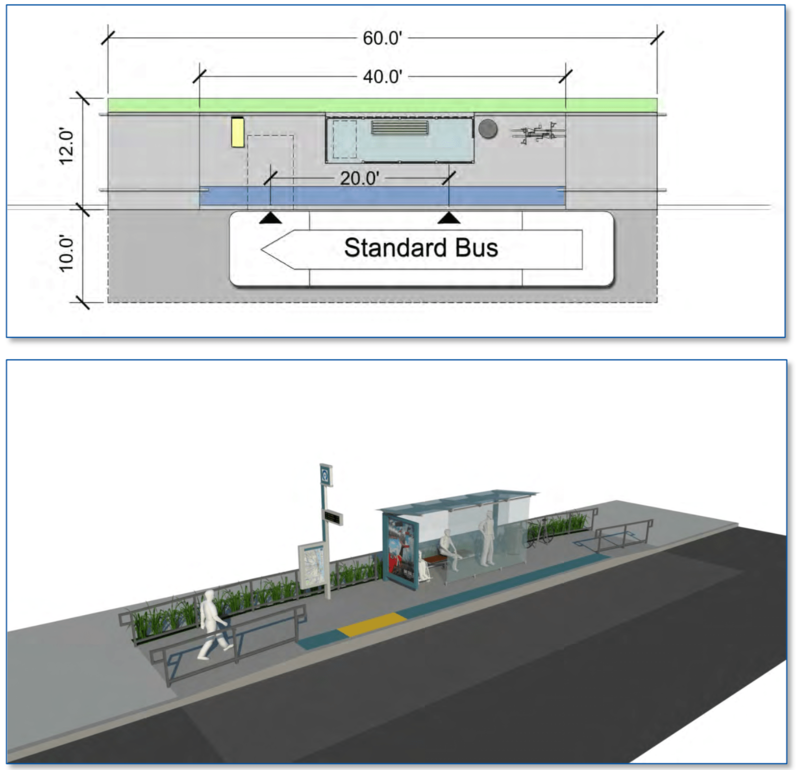 I’ve never looked into ART bus systems before but it seems to resemble what many call BRT Lite. Pace has minimal information on its website. Daniel Hertz, notable bus transit supporter, pointed me to an RFP [PDF, 10 MB] that describes the location and scope of Pace’s first (of many) ART corridors. The RFP describes this project as one of 24 corridors outlined in its Vision 2020 document “to provide a regional network of premium transit services”. It appears that premium is relative and that bus riders will have a more comfortable and easier-to-find bus station at which to wait – bus travel time will not change. I’ll try to paint you a picture of the built environment going north to south at the eight intermediate stops. This is one block south of Devon Avenue, in Norwood Park. There’s a conventional bike lane here but the Chicago Department of Transportation has noted that there just enough cars that reducing the number of general purpose lanes from four to two – part of a road diet that would add buffered or protected bike lanes – but many residents don’t support the project so the alderman has decided against supporting it. The land use and design is a blend of what came before it and what’s typical in Chicago: old buildings up against the sidewalk, closer-built single-family homes, some multi-unit buildings. Like Highland but now seeing fewer surface parking lots. Like the rest of the junctions we’re still in motordom; four of the six “first in line” motorists seen in Google Streetview are blocking the crosswalk while waiting for the light to turn green. Pace has established a $6 million budget for the station construction. The station platforms will span 40 to 110 feet, a raised platform that’s 12 inches tall, a new shelter, real-time bus tracker*, a common vertical marker, a single bike rack to hold two bicycles, and associated roadway, curb, and drainage improvements. It’s unfortunate to learn that the RFP mentions that shelters in Chicago may have to be the insufficiently designed kind JCDecaux operates for the city as part of a very long advertising contract. Pace shows a rendering mocking up a typical station design. I’m concerned the handrail at the rear of the bus will preclude using longer buses in the future, but that would be the least of Pace’s worries. * It appears that Pace will be using NextBus‘s real-time arrival information services (page A-6 of 14); they’re a company founded in 1996 and now owned by Cubic, which operates Ventra.